TubeNet • View topic - Bundy (Besson 2-20 Stencil) 1/2 Size Tuba w/ Case. Bundy (Besson 2-20 Stencil) 1/2 Size Tuba w/ Case. 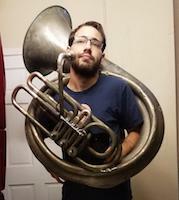 I'm looking to sell my sweet little bundy tuba in order to fund the restoration of a couple Yamaha YBB103's that I recently lucked into. Its a very solid little horn that's certainly not pristine, but is in great mechanical shape with tons of music left in it! Thanks for looking and feel free to ask any questions or fill me in on the history of this horn! Re: Bundy (Besson 2-20 Stencil) 1/2 Size Tuba w/ Case.